Jonathon Hare is a lecturer in the School of Electronics & Computer Science. 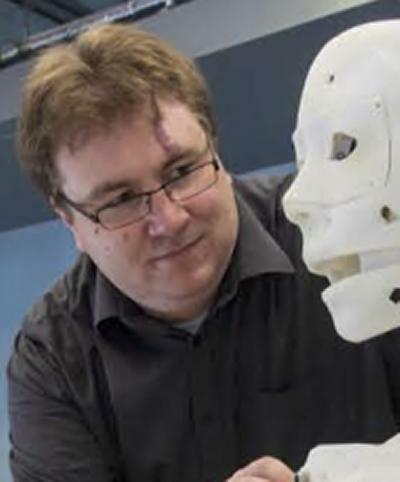 He holds a BEng degree in Aerospace Engineering and PhD in Computer Science, both from the University of Southampton. Jonathon has given a number of guest lectures on current trends in image retrieval and multimedia information management, including an invited talk on behalf of the Royal Institute. Jonathon's research interests lie in the area of multimedia data mining, analysis and retrieval, with a particular focus on large-scale multimodal approaches. This research area is at the convergence of machine learning and computer vision, but also encompasses other modalities of data. The long-term goal of his research is to innovate techniques that can allow machines to understand the information conveyed by multimedia data and use that information for fulfil the information needs of humans. He has published over 70 articles in peer-reviewed conferences and journals. Hare, J., Samangooei, S., & Dupplaw, D. (Accepted/In press). OpenIMAJ – Intelligent Multimedia Analysis in Java. ACM SIGMM Records. Enser, P. G. B., Sandom, C. J., Hare, J. S., & Lewis, P. H. (2007). Facing the reality of semantic image retrieval. Journal of Documentation, 63(4), 465-481. Hare, J. S., Lewis, P. H., Leow, W-K. (Ed. ), Lew, M. S. (Ed. ), Chua, T-S. (Ed. ), Ma, W-Y. (Ed. ), ... Bakker, E. M. (Ed.) (2005). On Image Retrieval using Salient Regions with Vector-Spaces and Latent Semantics. Lecture Notes in Computer Science, LNCS 3, 540-549. Hare, J. S., Lewis, P. H., Enser, P. (Ed. ), Kompatsiaris, Y. (Ed. ), & O'Connor, N. E. (Ed.) (2004). Salient Regions for Query by Image Content. Lecture Notes in Computer Science, 3115 /, 317-325. Maynard, D., Dietze, S., Peters, W., & Hare, J. (2012). Proceedings of the 1st International Workshop on Knowledge Extraction & Consolidation from Social Media (KECSM-2012), Boston, USA, November 12, 2012. (CEUR Workshop Proceedings; No. 895). Aachen, DE: CEUR-WS. Dahl, J., Hare, J., Kelley, K., Martinez, K., & Young, D. (2018). A structured light approach to imaging ancient Near Eastern cylinder seals: how efficient 3D imaging may facilitate corpuswide research. In K. Kelley, & R. Wood (Eds. ), Digital Imaging of Artefacts: Developments in Methods and Aims (pp. 49-74). (Access Archaeology). Archaeopress / British Archaeological Reports. Zhang, Y., Hare, J., & Prugel-Bennett, A. (Accepted/In press). Learning representations of sets through optimized permutations. Paper presented at International Conference on Learning Representations, New Orleans, United States. Vougiouklis, P., Maddalena, E., Hare, J., & Simperl, E. (2018). How biased is your NLG evaluation? In Proceedings of the 1st CrowdBias Workshop (pp. 1-3). Zurich, Switzerland. Zhang, Y., Hare, J., & Prügel-Bennett, A. (2018). Learning to count objects in natural images for visual question answering. Paper presented at International Conference on Learning Representations, Vancouver, Canada. Kaffee, L-A., Elsahar, H., Vougiouklis, P., Gravier, C., Laforest, F., Hare, J., & Simperl, E. (Accepted/In press). Learning to generate Wikipedia summaries for underserved languages from Wikidata. Paper presented at 16th Annual Conference of the North American Chapter of the Association for Computational Linguistics: Human Language Technologies, New Orleans, United States. Kramer, I. C., Hare, J., & Prugel-Bennett, A. (2017). A future perspective for automated detection of archaeology using deep learning with remote sensor data. Poster session presented at ACM WomENcourage , Barcelona, Spain. Sun, Y., Hare, J., & Nixon, M. (2017). Analysing acceleration for motion analysis. In The 13th International Conference on Signal Image Technology & Internet Based Systems: Signal Image Technology & Internet Based Systems (pp. 289-295). Jaipur, India. Kramer, I. C., Hare, J., Prugel-Bennett, A., & Sargent, I. (2017). Automated detection of archaeology in the New Forest using deep learning with remote sensor data. Abstract from New Forest Knowledge Conference 2017, Lyndhurst, United Kingdom. Kramer, I. C., Hare, J., & Prugel-Bennett, A. (2017). Automation on steroids: an exploration of why deep learning is dominating automation. Abstract from Aerial Archaeology Research Group 2017 Annual Meeting, Pula, Croatia. Sargent, I., Hare, J., Young, D., Wilson, O., Doidge, C., Holland, D., & Atkinson, P. M. (Accepted/In press). Inference and discovery in remote sensing data with features extracted using deep networks. Paper presented at AI-2017 Thirty-seventh SGAI International Conference on Artificial Intelligence. , Cambridge, United Kingdom. Kramer, I. C., Hare, J., & Prugel-Bennett, A. (Accepted/In press). Tackling the small data problem in deep learning with multi-sensor approaches. Abstract from 46th Computer Applications and Quantitative Methods in Archaeology, Tübingen, Germany. Vougiouklis, P., Hare, J., & Simperl, E. (2016). A neural network approach for knowledge-driven response generation. Paper presented at 26th International Conference on Computational Linguistics (COLING 2016), Japan. Mrabet, Y., Vougiouklis, P., Kilicoglu, H., Gardent, C., Demner-Fushman, D., Hare, J., & Simperl, E. (2016). Aligning texts and knowledge bases with semantic sentence simplification. 29-36. Paper presented at 2nd International Workshop on Natural Language Generation and the Semantic Web (WebNLG 2016), United Kingdom. Sun, Y., Hare, J., & Nixon, M. (2016). Detecting acceleration for gait and crime scene analysis. In 7th International Conference on Imaging for Crime Detection and Prevention (ICDP 2016) : Madrid, Spain 23 – 25 November 2016 (pp. 13-18). Institution of Engineering and Technology. Almudhahka, N., Nixon, M., & Hare, J. (Accepted/In press). Human face identification via comparative soft biometrics. Paper presented at IEEE International Conference on Identity, Security and Behavior Analysis 2016 (ISBA 2016), Japan. Almudhahka, N. Y., Nixon, M. S., & Hare, J. S. (2016). Unconstrained human identification using comparative facial soft biometrics. Paper presented at BTAS 2016: IEEE 8th International Conference on Biometrics Theory, Applications and Systems, United States. Preston, J., Hare, J., Samangooei, S., Davies, J., Jain, N., Dupplaw, D., & Lewis, P. H. (Accepted/In press). A Unified, Modular and Multimodal Approach to Search and Hyperlinking Video. Paper presented at MediaEval 2013 / Search and Hyperlinking of Television Content, Spain. Hare, J., Acosta, M., Weston, A., Simperl, E., Samangooei, S., Dupplaw, D., & Lewis, P. H. (Accepted/In press). An investigation of techniques that aim to improve the quality of labels provided by the crowd. Paper presented at MediaEval 2013 / Crowdsourcing for Social Multimedia, Spain. Jain, N., Hare, J., Samangooei, S., Preston, J., Davies, J., Dupplaw, D., & Lewis, P. H. (2013). Experiments in Diversifying Flickr Result Sets. Paper presented at MediaEval 2013 / Retrieving Diverse Social Images, Spain. Davies, J., Hare, J., Samangooei, S., Preston, J., Jain, N., Dupplaw, D., & Lewis, P. H. (Accepted/In press). Identifying the Geographic Location of an Image with a Multimodal Probability Density Function. Paper presented at MediaEval 2013 / Placing: Geo-coordinate Prediction for Social Multimedia, Spain. Maynard, D., Dupplaw, D., & Hare, J. (2013). Multimodal Sentiment Analysis of Social Media. Paper presented at BCS SGAI Workshop on Social Media Analysis, . Samangooei, S., Hare, J., Dupplaw, D., Niranjan, M., Gibbins, N., Lewis, P. H., ... Preston, J. (Accepted/In press). Social Event Detection via sparse multi-modal feature selection and incremental density based clustering. Paper presented at MediaEval 2013 / Social Event Detection for Social Multimedia, Spain. Packer, H. S., Samangooei, S., Hare, J. S., Gibbins, N., & Lewis, P. (2012). Event Detection using Twitter and Structured Semantic Query Expansion. Paper presented at CrowdSens 2012 Workshop, United States. Zerr, S., Siersdorfer, S., Hare, J., & Demidova, E. (2012). I know what you did last summer! - privacy-aware image classification and search. SIGIR '12, United States. Hare, J., Samangooei, S., Dupplaw, D., & Lewis, P. H. (2012). ImageTerrier: an extensible platform for scalable high-performance image retrieval. Poster session presented at ACM International Conference on Multimedia Retrieval (ICMR'12), Hong Kong. Zerr, S., Siersdorfer, S., & Hare, J. (2012). PicAlert! : a system for privacy-aware image classification and retrieval. 21st ACM Conference on Information and Knowledge Management (CIKM 2012), United States. Packer, H. S., Hare, J. S., Samangooei, S., & Lewis, P. (2012). Semantically Tagging Images of Landmarks. Paper presented at Knowledge extraction and consolidation from social media (KECSM) 2012 Workshop, United States. Hare, J., Samangooei, S., & Lewis, P. (2011). Efficient clustering and quantisation of SIFT features: Exploiting characteristics of the SIFT descriptor and interest region detectors under image inversion. Poster session presented at The ACM International Conference on Multimedia Retrieval (ICMR 2011), Italy. Hare, J., Samangooei, S., & Dupplaw, D. (2011). OpenIMAJ and ImageTerrier: Java Libraries and Tools for Scalable Multimedia Analysis and Indexing of Images. 691-694. ACM Multimedia 2011, United States. Siersdorfer, S., Hare, J., Minack, E., & Deng, F. (2010). Analyzing and Predicting Sentiment of Images on the Social Web. 715-718. Poster session presented at ACM Multimedia 2010, Italy. Hare, J., & Lewis, P. (2010). Automatically Annotating the MIR Flickr Dataset: Experimental Protocols, Openly Available Data and Semantic Spaces. 547-556. Poster session presented at MIR '10: Proceedings of the international conference on Multimedia information retrieval, United States. Zontone, P., Boato, G., Hare, J., Lewis, P., Siersdorfer, S., & Minack, E. (2010). Image and Collateral Text in Support of Auto-annotation and Sentiment Analysis. 88-92. TextGraphs-5: Graph-based Methods for Natural Language Processing, Sweden. Hare, J., & Lewis, P. (2010). Semantic Retrieval and Automatic Annotation: Linear Transformations, Correlation and Semantic Spaces. Imaging and Printing in a Web 2.0 World; and Multimedia Content Access: Algorithms and Systems IV, United States. Hare, J., Dupplaw, D., Lewis, P., Borri, F. (Ed. ), Nardi, A. (Ed. ), & Peters, C. (Ed.) (2009). IAM@ImageCLEFphoto 2009: Experiments on Maximising Diversity using Image Features. 42-42. Poster session presented at CLEF 2009 Workshop, Greece. Hare, J., Lewis, P., Borri, F. (Ed. ), Nardi, A. (Ed. ), & Peters, C. (Ed.) (2009). IAM@ImageCLEFPhotoAnnotation 2009: Naïve application of a linear-algebraic semantic space. 66-66. Poster session presented at CLEF 2009 Workshop, Greece. Zontone, P., Boato, G., De Natale, F. G. B., De Rosa, A., Barni, M., Piva, A., ... Lewis, P. (2009). Image diversity analysis: context, opinion and bias. The First International Workshop on Living Web: Making Web Diversity a true asset, United States. Hare, J., Sinclair, P., Lewis, P., Martinez, K., Gevers, T. (Ed. ), Jain, R. (Ed. ), & Santini, S. (Ed.) (2008). Giving order to image queries. 682005-1. Multimedia Content Access: Algorithms and Systems II, United States. Hare, J., Lewis, P., Gordon, L., Hart, G., Gevers, T. (Ed. ), Jain, R. (Ed. ), & Santini, S. (Ed.) (2008). MapSnapper: Engineering an Efficient Algorithm for Matching Images of Maps from Mobile Phones. 68200L-1. Multimedia Content Access: Algorithms and Systems II, United States. Hare, J., Samangooei, S., Lewis, P., & Nixon, M. (2008). Semantic spaces revisited: investigating the performance of auto-annotation and semantic retrieval using semantic spaces. 359-368. Poster session presented at CIVR '08: The 2008 international conference on Content-based image and video retrieval, Canada. Hare, J. S., Lewis, P. H., Enser, P. G. B., & Sandom, C. J. (2007). How to spot a Dalmatian in a pack of Dogs; A data-driven approach to searching unannotated images using natural language. Poster session presented at Multimedia Knowledge Management: Industry meets academia, . Hare, J. S., Lewis, P. H., Enser, P. G. B., & Sandom, C. J. (2007). Semantic Facets: An in-depth Analysis of a Semantic Image Retrieval System. Poster session presented at ACM CIVR 2007: The 6th International Conference on Image and Video Retrieval, Netherlands. Hare, J. S., Sinclair, P. A. S., Lewis, P. H., Martinez, K., Enser, P. G. B., Sandom, C. J., ... Stoermer, H. (Ed.) (2006). Bridging the Semantic Gap in Multimedia Information Retrieval: Top-down and Bottom-up approaches. Mastering the Gap: From Information Extraction to Semantic Representation / 3rd European Semantic Web Conference, Montenegro. Tang, J., Hare, J. S., & Lewis, P. H. (2006). Image Auto-annotation using a Statistical Model with Salient Regions. IEEE International Conference on Multimedia & Expo (ICME), Canada. Hare, J. S., Lewis, P. H., Enser, P. G. B., Sandom, C. J., Chang, E. Y. (Ed. ), Hanjalic, A. (Ed. ), & Sebe, N. (Ed.) (2006). Mind the Gap: Another look at the problem of the semantic gap in image retrieval. 607309-1. Multimedia Content Analysis, Management and Retrieval 2006, United States. Enser, P. G. B., Sandom, C. J., Lewis, P. H., & Hare, J. S. (2006). The Reality of the Semantic Gap in Image Retrieval. The Reality of the Semantic Gap in Image Retrieval, tutorial held in conjunction with the 1st International Conference on Semantic and Digital Media Technologies, Greece. Hare, J. S., Lewis, P. H., Lienhart, R. W. (Ed. ), Babaguchi, N. (Ed. ), & Chang, E. Y. (Ed.) (2005). Content-based image retrieval using a mobile device as a novel interface. 64-75. Paper presented at Storage and Retrieval Methods and Applications for Multimedia 2005, United States. Hare, J. S., & Lewis, P. H. (2005). Saliency-based Models of Image Content and their Application to Auto-Annotation by Semantic Propagation. Multimedia and the Semantic Web / European Semantic Web Conference 2005, . Hare, J. S., & Lewis, P. H. (2003). Scale Saliency: Applications in Visual Matching, Tracking and View-Based Object Recognition. 436-440. Distributed Multimedia Systems 2003 / Visual Information Systems 2003, United States. Hare, J., Newman, D., Peters, W., Greenwood, M., & Eggink, J. (2014). SemanticNews: Enriching publishing of news stories. University of Southampton. Sandom, C., Hare, J., Enser, P., & Lewis, P. (Accepted/In press). Bridging the Semantic Gap in Visual Information Retrieval: End of Project Report. s.n. Karam, M., Hare, J., Lewis, P., & schraefel, M. C. (2006). Ambient Gestures. s.n. Hare, J., Karam, M., Lewis, P., & schraefel, M. C. (2005). iGesture: A Platform for Investigating Multimodal, Multimedia Gesture-based Interactions. s.n.